Join us this Monday for a special Shacharit morning service in honor of the Bar Mitzvah of Yosef Hirsch who will be donning Tefillin for his very first time! (If you have Tefillin bring them along). Kids: Challah Baking - This Sunday! HEY KIDS! 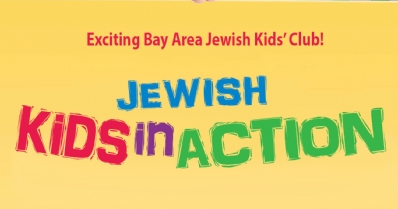 Join us this Sunday, December 20th for a fun Challah Baking activity as we launch this year's "Jewish Kids In Action" program! The theme at JKA this year will be "Kids in the Kitchen!" At our first event you'll learn first hand how to make your very own Challah and have fun with braiding and flavoring it with your favorite toppings! Thank you! We did it together! Thank you to everyone who helped make our year-end matching campaign such a wonderful success! With your generous participation, we met and even exceeded our goal! An additional extra special thanks to our Matchers: Mardy Schweitzer, The Wolraich Family and Art Sadin! If you would like to join in the end of year tax-deductible giving, click here. 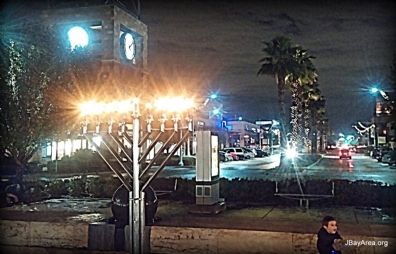 The fully lit menorah casts its warm glow at the Menorah Lighting in Pearland Town Center this past Sunday! Chanukah In 'Outer Space!' at Baybrook Mall with the first ever "Space Menorah!" Join us online this Thursday, December 17 - the fifth of Tevet - for an extraordinary 24 hour fundraising campaign! For 24 hours only, every dollar that you donate will be doubled on the spot by matching donors! That's right - doubled! Chabad of the Bay Area counts entirely on the grass-roots support of people like yourself to enable its work. Your participation in this special campaign will help us cover this year's budget and be on firm ground for continued activities and growth in 2016. Rounding out the year: End of year giving! This year also saw the launch of our new Center for Jewish Life & Learning to enable us to further broaden our ability to provide more meaningful opportunities for Jewish learning and celebration throughout the Bay Area! As an independent non-profit, Chabad of the Bay Area is made possible by your partnership and generosity. Every little bit counts and makes a big difference. Last Eve of Chanukah: Pearland Menorah Lighting! Tomorrow: SPECIAL SHABBAT Chanukah - Rabbi's Birthday Kiddush! Join us TOMORROW, Saturday, December 12, for a special Shabbat service and lunch! It's Rosh Chodesh (start of new Hebrew month)! Kiddush Lunch sponsored in honor of the Rabbi's Birthday! 12:00 pm (approx) - Kiddush Lunch sponsored by Rabbi Yitzchok & Malky Schmukler in honor of the RABBI'S BIRTHDAY! A wonderful crowd turned out for the annual Chanukah celebration at Baybrook Mall this past Monday! The highlight of the event wast the lighting of the first ever "Space Menorah" which was uniquely designed just for this event! 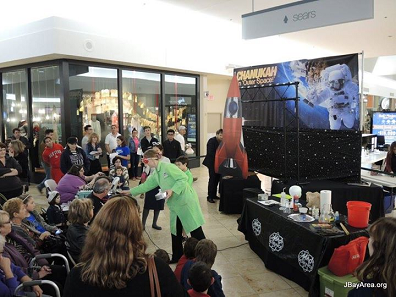 Participants were also treated to a Mad Science show, facepainting, delicious Chanukah treats and raffles with fun prizes. Thank you to everyone who came out and made the event such a success! Galveston Mayor to attend Chanukah On The Strand! We are pleased to announce that Galveston Mayor Jim Yarbrough will be joining Chanukah On The Strand. The event will be held this Wednesday, 7 pm, at Gavleston's Saengerfest Park. The Mayor will share greetings on behalf of the city and join in the lighting of the Menorah. 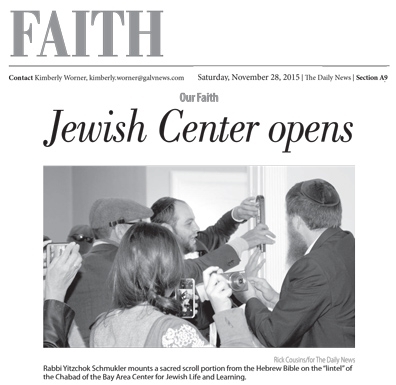 The Galveston Daily News featured a nice write-up on last week's Grand Opening of the Chabad Bay Area - Center for Jewish Life & Learning. MEGA 20th Anniversary Chanukah festival in Houston! The biggest Chanukah event in Texas history is set to hit the Houston stage with 1000s expected to be in attendance. This event is co-hosted by the City of Houston and will be in front of Houston City Hall on Dec 6th from 3pm and on. You can expect to see a large array of activities and booths, arts and crafts, Houston Rockets Fan Zone, raffle, and a dazzling food quarter, provided by Genesis, Laykies & My Pita. Also featuring: Live concert, Public Menorah Lighting and Spectacular Firework show! Exciting Chanukah Events - THIS WEEK! Raffle for a NASA tour and other prizes! JOIN IN - SPREAD THE WORD!